The construction worker tries everything – he coaxes, cajoles and threatens – nothing, nada, zip! When I’m at practice with the “Silver Birch Minstrels” I can sing up a storm – belt them out like a pro (loud, not good, mind you… but still – there’s sound coming out of me and it’s sort of like music). Then Friday night rolls around, the seniors pour into the auditorium, I open my mouth and… nothing… “BRRRRR-RIBET.” I can only croak. My heart pounds, my throat is dry and my knees are knocking. I just hope I can make it through the show without keeling over with a heart attack. 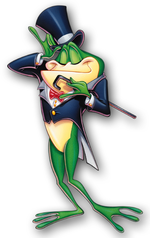 Why is it that I turn into Michigan J. Frog in front of an audience? Why is it that I can lecture to an auditorium of 600 students with no jitters at all – yet I’m a bundle of frazzled nerves in front of anyone when I am holding that fiddle or trying to sing? I blame it on the mass media. A hundred years ago – most everyone who played an instrument would hop right to it in front of a crowd without being the least bit self-conscious. Everyone, good or bad, would sing along with them – bellowing out the song at the top of their lungs – mostly off-key and out of time with each other – all without being the least bit self-conscious. And they all enjoyed themselves immensely. It’s how people entertained themselves before radio, TV, and the Internet started bringing them professional entertainment. This entry was posted in Fiddlin' Around and tagged Animals, Bugs Bunny, Fiddle, froggy evening, merry melodies, michigan rag, Music, Nature, Ramblings, violin. Bookmark the permalink. Loved the Michigan J. Frog episode from Merry Melodies…one of my favorite of all times! And I loved this post just as much…great comparison you chose to use. I’m sure you play and sing beautifully all the time–whenever I’m heard you sing/play I am always in awe!